One of the challenges of teaching Big History, as with all social studies and science subjects, is how we as teachers introduce students to new research and current controversies. Although this may be hard work, it’s an invaluable tool in helping students see the relevance of the course. But what’s the best way to integrate a current issue into BHPs concepts and framework? The recent discovery of Homo naledi offered a great opportunity to practice fitting a contemporary issue into the BHP curriculum at the same time that we emphasize the course’s relevance to today’s world. We’re in Unit 6 and studying the development of humans, but what angle should we take in introducing Homo naledi? One approach is to center on the often-neglected claim testers. 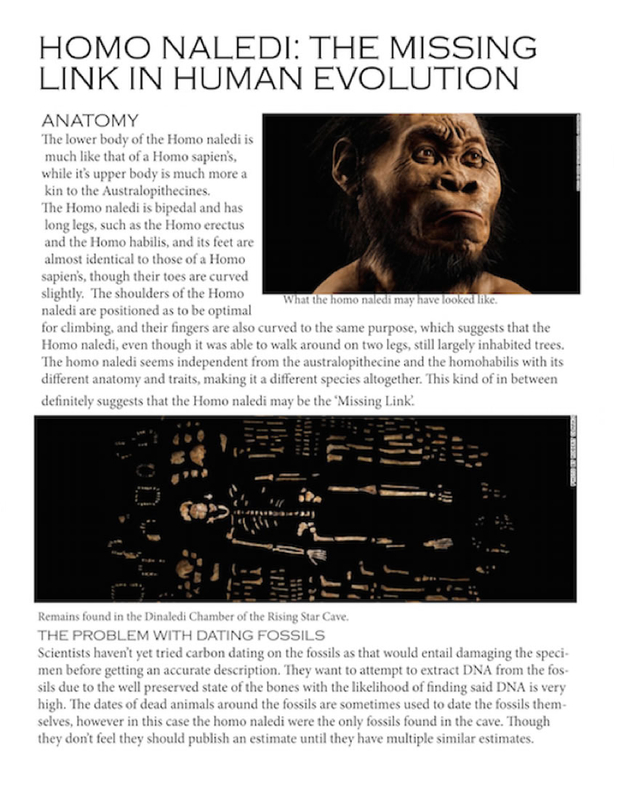 When introducing a news story like the recent Homo naledi discovery, it’s important to have a reliable, accessible article or source for the kids to analyze. 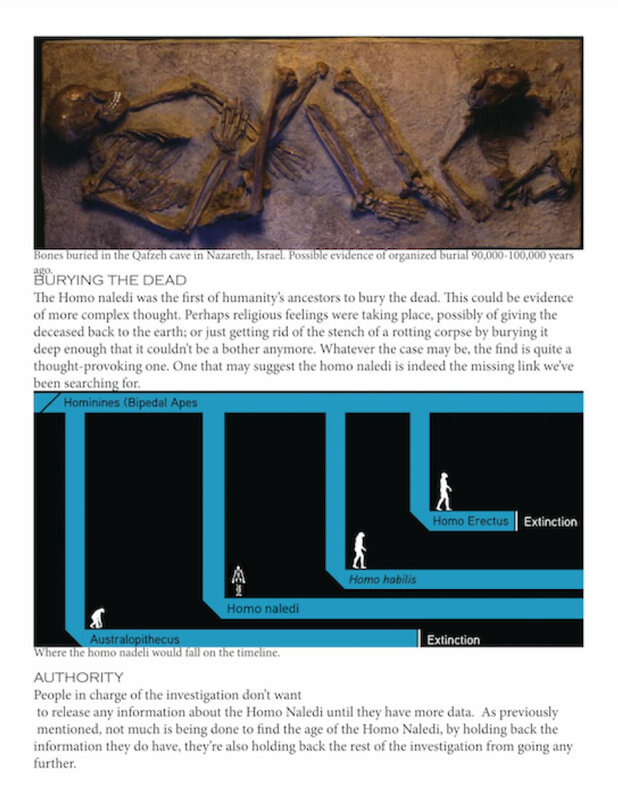 I built my activity around National Geographic’s summary of the discovery of Homo naledi. A bonus to using this article is that it provides an opportunity to discuss the validity of the source, as it was National Geographic that sponsored Berger, who plays an important role in the discovery. 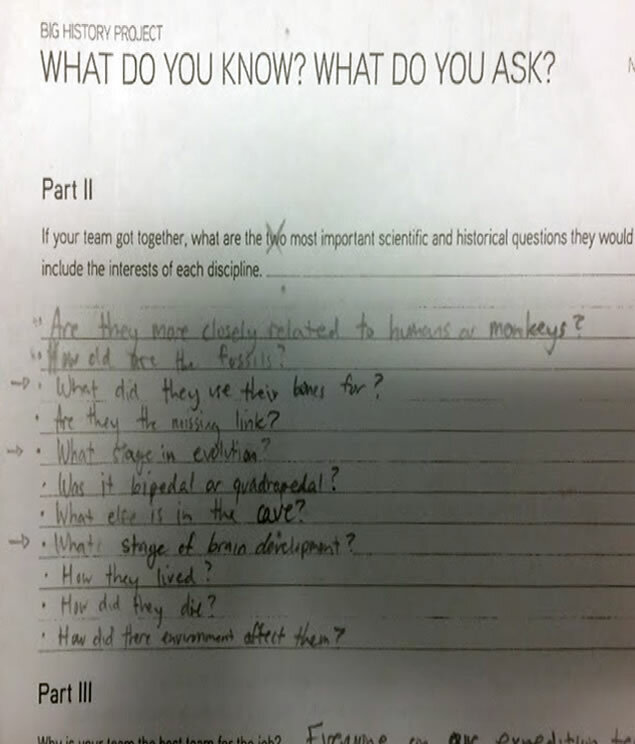 On the lesson’s first day, I introduced the article to the kids, using the “What do you know? What do you ask?” activity. I showed the image of the cave taken from the website (see below) and asked the students: “Who would you bring with you on this expedition and what questions would you ask?” Students should have some knowledge of the different disciplines by this unit, but to help those struggling, I included a list of professions and disciplines that they could choose from. Students enjoyed competing with each other to put together the best team for the expedition and I gave away a Big History Project poster and notebook to the winning team. Some students who presented were also keen to try out the cave tunnel for themselves so we re-created the 10-inch gap of Superman’s Crawl. 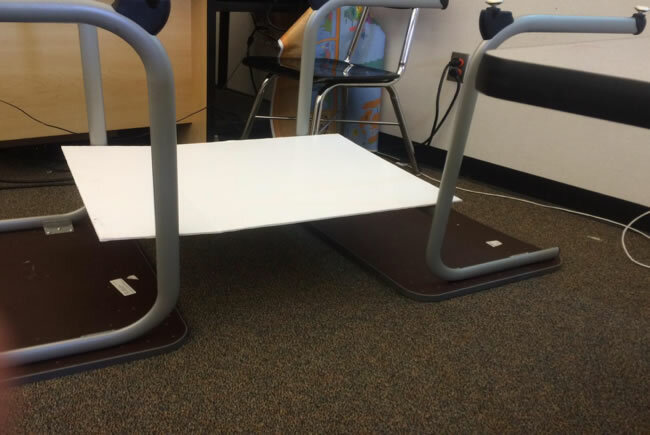 Students had fun trying to get through it. The student responses were varied and creative. For their experts, students included everyone from anthropologists to speleologists to journalists. I encouraged students who were struggling to do some backward planning, suggesting that they think about the questions they would ask once they got to the cave, and then think about who would be best able to answer them. What do you know? Who do you ask? Who would you bring with you on this expedition? 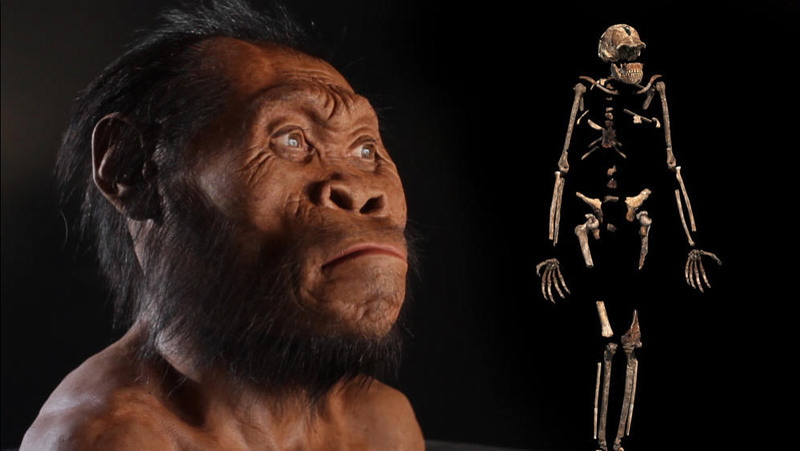 Homo naledi: is this the “missing link” in our evolutionary story? What claim testers can we use to answer this question? 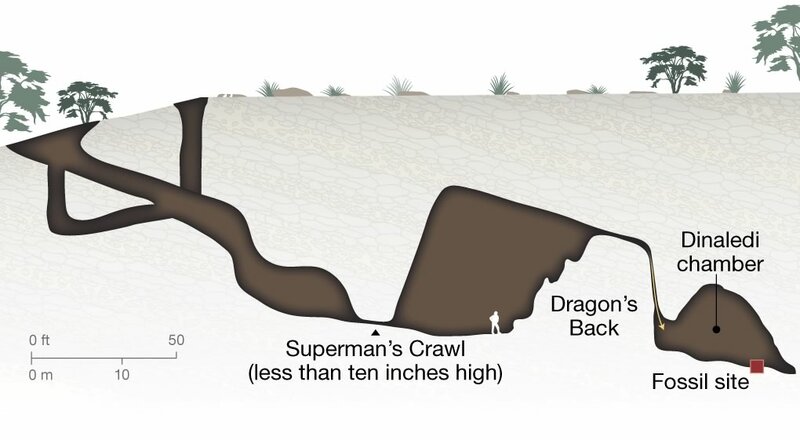 How much evidence was taken from the cave system? Why was this a race against time? How did the fossils get there and why is this significant? I divided students into groups and had them look for specific content within the National Geographic piece and other relevant articles I had found. I gave each group a set of questions to answer when looking at their assigned content. Students used a graphic organizer to record their answers. When they were finished, the groups presented their ideas to the rest of the class. Next, I asked students to complete a report for the 2016 Paleoanthropological Conference, focusing on whether Homo naledi is the missing link and if not, suggesting where it fits in our evolutionary story. Students worked in groups to complete either a two-page magazine/journal style report or an infographic that answered a series of key questions built around the claim testers. 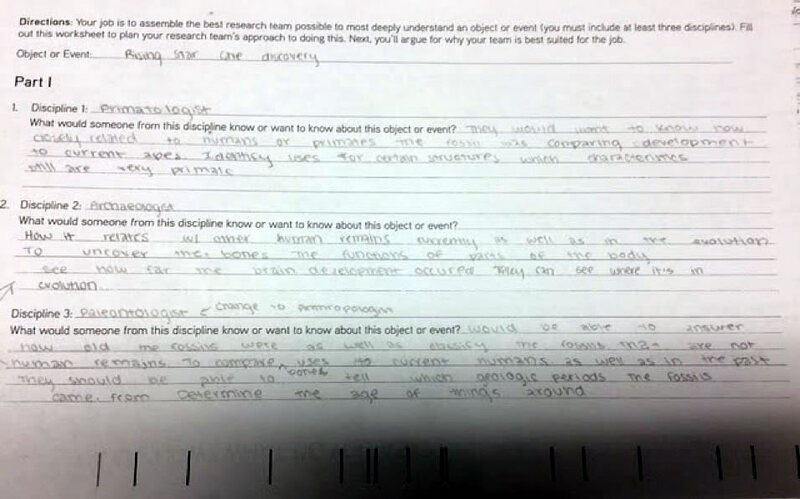 I provided a rubric that placed an emphasis on their application of the claim testers. Some students were confused by what was meant by the term missing link, so we discussed this using the Big History timeline I had annotated (see image below). Students had to produce their own timeline as part of their report. In their presentations and papers, students provided some reflective and analytical responses. 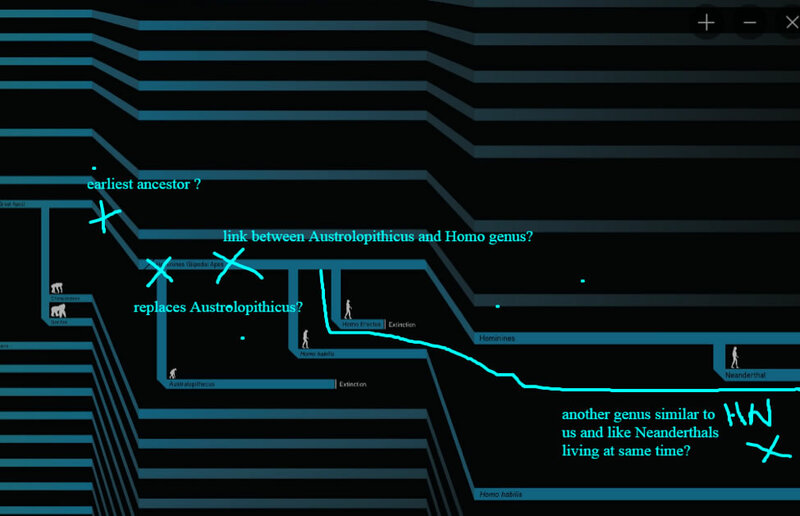 For example, one group took the “braided stream” interpretation of evolution to argue that Homo naledi was a modern cousin of Homo sapiens who became extinct because of their small brain size. All groups were comfortable using evidence to prove their arguments, but less secure in using the other claim testers. For a quick review, we took another look at the How Do We Decide What to Believe? video, Bob Bain’s introduction to claim testers in Unit 2. Many then understood how Berger’s discovery had challenged the existing authority of East African evolution. The job of placing Homo naledi on the evolutionary timeline gave students an appreciation of the scale of our recent evolution, forcing them to see how our recent evolution fits on the Big History timeline. 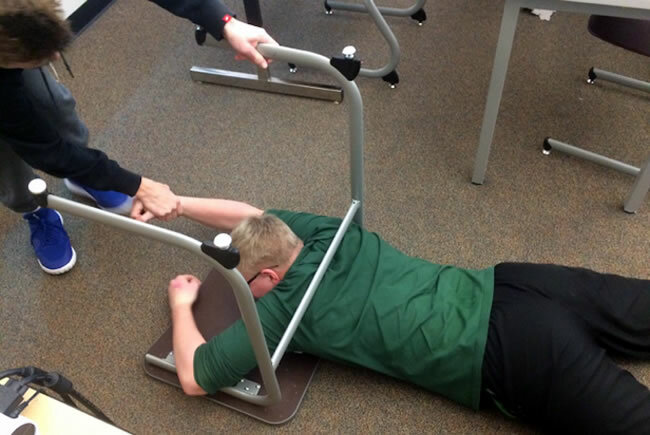 This “Ways of Knowing” activity really engaged the students and I encourage you to try using it in other scenarios. Perhaps the discovery of a life on an exoplanet (Units 4 and 5), or a new civilization (Unit 7).This activity was also a great way of exposing students to the multidisciplinary nature of Big History. Who knows? Maybe one of my students will aspire to be the next great paleoanthropologist!